Awards will be given for the top 3 overall Male and Female Finishers and the top 3 finishers in the following age groups: (18-29, 30-39, 40-49, 50 & up). All competitors must be 18 years or older by race day. Awards will be given to the Top Overall winning team in MALE(includes Male & Senior Male), FEMALE(includes Female & Senior Female) and MIXED .... and for the top 3 Teams in each category. Competitors can enter teams as Male, Female, Mixed, Senior Male, Senior Female, or Sponsor. All Senior Team members must be 50 or older the day of the race. All competitors must be 18 years or older by race day. Teams can consist of 2 or 3 members. Mixed teams must have at least one male and one female member. Awards will be given to the top teams in each of the divisions listed above. 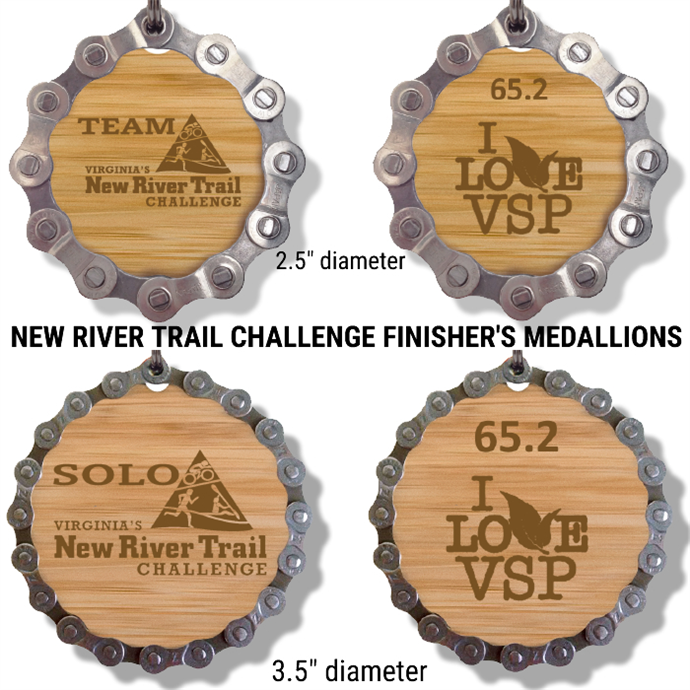 The New River Trail Challenge will be limited to the first 300 registered participants. For example: 150 individuals & 50, 3 person teams. Once registrations have reached 300 in any combination of individuals and team members, registration will be closed. From I-77, take Exit 24 go east on Route 69 to Route 52 (Fort Chiswell Rd. ), go north to Route 608 (Foster Falls Rd. ), go east and follow the brown park signs into the Foster Falls Access. Packet pick up is 4pm-8pm Friday night before the race or 6:30-7:30 race day at the train depot inside the park. Anyone not preregistered must register by 7:00 race day. Instructions will be given for boat drop off at registration.